Enter John Brown, the legendary abolitionist who’s committed a few murders himself and whose likeness is plastered on Wanted posters in several states. An argument with Henry’s owner leaves the boy’s father dead, and Brown takes Henry into his band. Over the next four years, ending with the failed rebellion at Harper’s Ferry, the two repeatedly separate and find one another again, their fates bound in many an ironic twist. 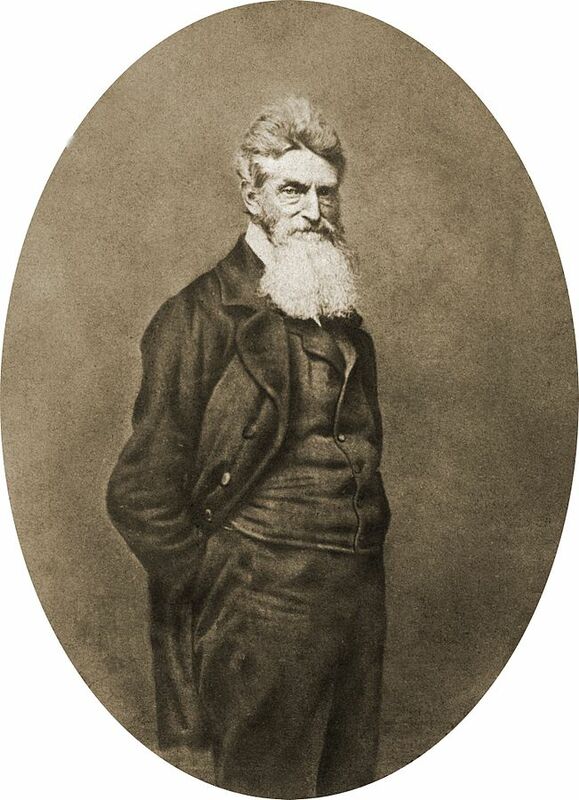 John Brown, 1859, copy of a daguerreotype attributed to Martin M. Lawrence (Courtesy Library of Congress via Wikimedia Commons; public domain). He stood mute, as usual, apparently thinking something through. His face, always aged, looked even older. It looked absolutely spongy with wrinkles. His beard was no fully white and ragged, and so long it growed down to his chest and could’a doubled for a hawk’s nest. He had gotten a new set of clothes someplace, but they were only worse new versions of the same thing he wore before . . withered, crumpled, and chewed at the edges. . . . In other words, he looked normal, like his clothes was dying of thirst, and he himself was about to keel over out of plain ugliness. Brave as John Brown is in battle or by hewing strictly to his convictions, don’t ever ask him a direct question, because he’ll unleash a sermon that lasts for hours. Many are hilarious, and such is the fear he instills in his men, even his sons, nobody dares interrupt or hurry him to get to the point. I also laughed when Henry meets Frederick Douglass, whom the boy (still disguised as a girl) has to drink under the table to ward off the leader’s groping hands. Douglass comes off poorly in this book, as all talk about freedom but no action, whereas Harriet Tubman is another matter. She sees right through Henry, sensing his cowardice and belief in nothing except saving himself. That’s the lesson that Henry learns, slowly, as he moves from frying pan to fire to another, hotter frying pan: that being a man means the willingness to act like one. But that prescription is particularly difficult when he’s trying to pass as a girl, though it’s laughable how easily he fools the men around him (albeit seldom the women, of course). His disguise carries a particular risk when he’s away from Brown’s band, for white men cozy up to him, and he can’t drink them under the table. So The Good Lord Bird isn’t just about racial identity; it’s about power and what it confers on those who wish to use it, sexually or otherwise. Much as I like McBride’s prose and the picaresque aspect to a brutal subject–both of which remind me of Joe R. Lansdale’s Paradise Sky–they don’t sustain The Good Lord Bird at its considerable length. Henry’s adventures feel repetitive after awhile, with no new point to make, no further envelopes to push. To be sure, McBride’s a marvelous storyteller, never letting his protagonist off the hook, but by the midpoint, the only question is whether Henry will escape before Harper’s Ferry, and you know how that will turn out even if you haven’t read the jacket flap. All the same, The Good Lord Bird is worth a look. I’ve always wondered whether John Brown was a maniac or a prophet just before his time, and McBride’s portrayal has given me a lot to think about.